I love the color red. 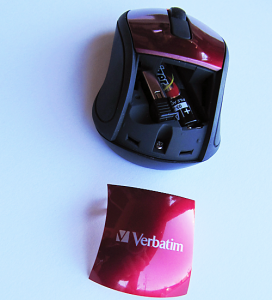 When I received Verbatim’s red Go Mini travel mouse, I knew it would be inseparable from my laptop. The travel mouse is very lightweight, a mere 7.5 ounces, takes two AAA batteries (included), and has a nano 2.4 GHz wireless receiver that plugs into a USB 2.0 port and is also USB 1.1 compatible. There is a small rear compartment that is the battery case and stores the nano receiver. The device has a tiny scroll wheel as well as a left and right mouse click mechanism. There is a small on/off switch on the underside of the mouse. It’s compatible with Windows 7, XP, 2000, and Vista and Mac OSX 10.4X and higher. I tested it on a Macbook Pro, PowerBook, and iMac. I really like this portable mouse. You just plug in the nano receiver, turn the switch on, and it’s ready to go. It is rather small but I found it comfortable to use without hand or wrist fatigue. Users with large fingers or hands might find that it is a bit too small. I used it with and without mouse pad and found it made virtually no difference with cursor speed or sensitivity. The scroll wheel is zippy and tracks well without any hesitation or drag. The nano receiver is unobtrusive and from the USB port sticks out approximately a half inch. I have been using it on a daily basis for the past three weeks with the original batteries I inserted, so battery life seems to be adequate. The storage compartment lid slides off and seems a bit flimsy. I had some difficulty snapping it into place and noticed if you are too heavy handed, there are two small plastic clips on each side that could possible break off. The range of the wireless is quite good as I lost wireless connection at about 11 feet. 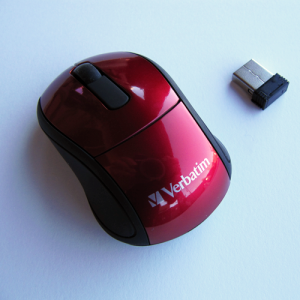 There is a proliferation of portable and compact laptop mice on the market recently, and Verbatim’s Go Mini Travel Mouse is a viable contender. It’s sleek, stylish, fast, and besides red, is offered in many colors so you can choose your favorite. A quick start guide is included but once you insert the batteries into the battery compartment, plug in the nano receiver, and turn on the device, you are ready to go. A decent product at a reasonable price.